The Chunnel is an underwater railway that connects England and France. Its trains barrel across the European countryside — and through its waters — at up to 186 miles per hour, which means you can get from one country to the next in a little over two hours. I recently learned that the Chunnel is one of the Seven Wonders of the Modern World, and it certainly deserves this status. It was one of many experiences that left me marveling at human ingenuity and history during our week in Europe. We did our best to sleep on the Chunnel train and, when that failed, drank their horrible coffee. You would think it would be harder to build an international underwater tunnel than it would be to make coffee, but Europe somehow succeeded at the former and still struggles with the latter. Our train arrived in London at the St Pancras railway station (apparently Brits don’t put a period after “St” the way Americans do) full of hopes about how many British sights we could squeeze into a single day. London is, as you know, the site of many important historic events and the home to many important historic figures. 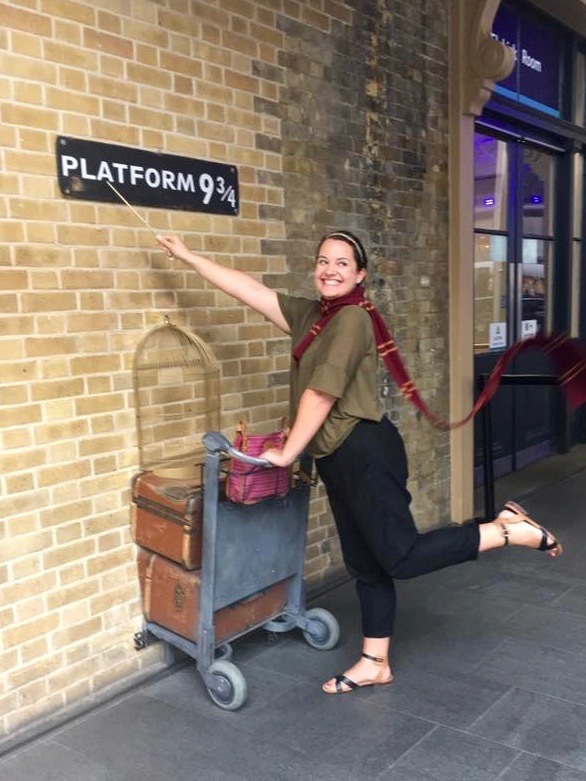 And because we are Americans with limited time and healthy priorities, we started with the most historically important place of them all: Platform 9 3/4 of King’s Cross railway station, where the famous wizard Harry Potter once pushed his trolley through a brick wall. Actually we started there because King’s Cross was just across the road from St Pancras, BUT STILL. It was my top priority of the day. After a running start, Marie and Taylor and I each successfully pushed our trolleys through the wall as well and boarded the Hogwarts Express. 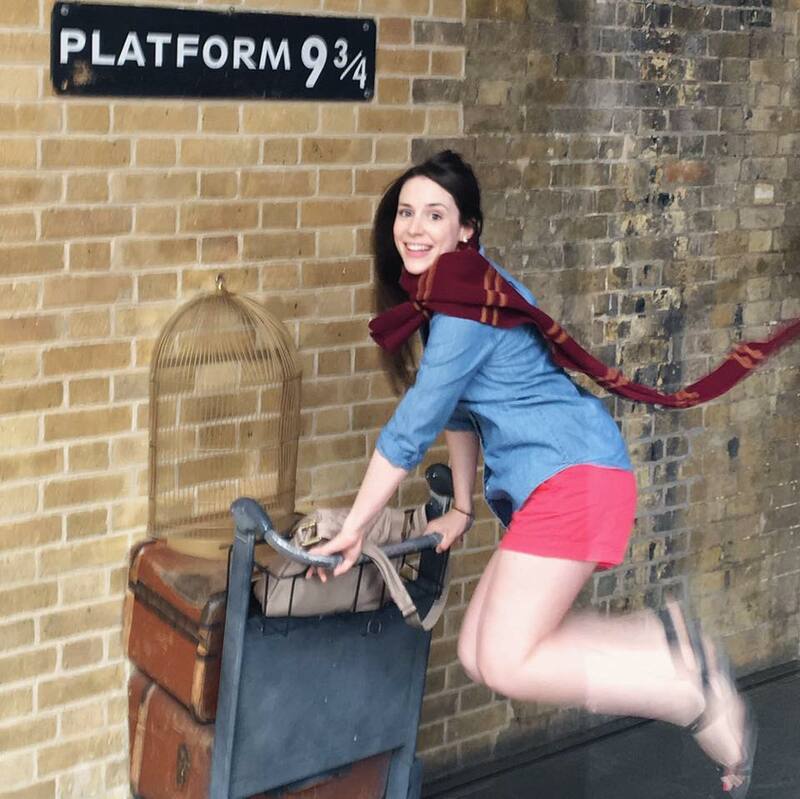 Just kidding, but we did pose for pictures at the wall King’s Cross has designated with the Platform 9 3/4 title. I would like to shake the hand of the marketing genius who decided to build a Harry Potter store there. There are employees who lend you props, help you pose and take your picture. They even toss your scarf to give you that mid-jump look. This is undoubtedly because they are trying to sell you a $15 photo like they do at an amusement park, but they are also quite willing to let you take your own photo and even aid you in that pursuit. (You can expand any of my tiny pics below by clicking on them, btw.) We briefly browsed the Harry Potter shop before venturing outside and underground to buy day passes for the Tube, which we took to Piccadilly Circus. Piccadilly Circus looked just like the London I’d imagined — the double decker buses, the British flags, the historic buildings. It felt so surreal. It should’ve felt new, but it felt familiar, like somewhere I’d been in a dream or perhaps like somewhere I’d come from but never visited (or, more likely, like somewhere I'd seen in the movies a million times). These are my people, I kept thinking. Maybe it was because I was finally back in a country where I spoke the language. Maybe it was because I have a lot of British blood in me. Either way, we had a fast-paced day overall, but every once in a while, I’d stop and think, “You’re in London.” Pinch me. All that to say, pretty much everything I see in my day-to-day life in the U.S. falls to the right of the “America” line. It’s all less than 300 years old, so mentally, I stay zoomed in on that little portion of human history almost all the time. In Paris and London, I think people must stay zoomed further out on their mental timelines. How could they not, when you can turn this way and that and see structures that are 600, 700, sometimes 1,000 years old? That was quite an aside, so now I’m gonna need you to zoom back in with me to June 2016. From Piccadilly Circus we started looking for a place to breakfast and ended up walking to Trafalgar Square and stopping at a pub called The Admiralty. (We didn’t actually realize at that point that we were in Trafalgar Square and spent quite a bit of time later in the day trying to find the square only to realize we’d been there earlier. Whoops.) The Admiralty is themed after the HMS Victory, a Royal Navy ship from the late 1700s, so it basically feels like you’re eating breakfast on the set of Pirates of the Caribbean. Unfortunately, we did not see Orlando Bloom. Maybe next time. We then walked toward Westminster, stopping to marvel over Big Ben and the Palace of Westminster (a.k.a. the Parliament building). It was rebuilt in the mid-1800s following a fire, so the building itself isn’t mind-bogglingly old, but its site was home to the kings of England from the 1000s to the 1500s, so it has quite a storied history. Across the street was Westminster Abbey, which puts the Parliament building to shame, its construction having started in the 1200s. (For those my age, Westminster Abbey is likely most memorable as the site of William and Kate’s famed wedding a few years ago.) The detail on both the Parliament building and Westminster Abbey is unreal. That such structures could’ve been planned and built before computers and electronic calculators and CRANES for heaven’s sakes — wait, this just in … I just looked up cranes, and apparently they’ve been around since the 400s. I retract my statement. BUT STILL. These buildings were amazing. When we were almost to the Tower, we passed a church building with a sign that caught my eye: “All Hallows by the Tower,” it read. It listed its historic connections — among them, William Penn, founder of Pennsylvania. Those who know me well know Penn is my middle name. William Penn is a distant relative on my mother’s father’s side. (As far as we can tell from family trees, we are not William Penn's descendants but, rather, descendants of his brother. I wasn’t named for these Penns, but I was named for some women on their side of the family.) Obviously we had to go in. Inside I learned that not only is All Hallows the oldest church building in London (Anglican, obviously), having been built in 675, but that it owes the very fact that it is standing to William's father, my great-great-great-great-I-have-no-idea-how-many-greats grandfather — Sir William Penn, Admiral of the Royal Navy — who saved it from the Great Fire of London in 1666 by having surrounding buildings destroyed to create fire breaks that blocked the flames. My little raised-Anglican heart swelled with pride. We continued toward the Tower of London — where the younger William Penn, the famous one, was actually imprisoned for heresy at one point (whoops). The Anglican church’s early days are not something to be particularly proud of, so I’m not sure whether he was actually being heretical or whether he was just being persecuted for telling the TROWTH (as my roommate pronounces it), but seeing as he was a Quaker and all, I'm gonna guess that he was in fact being heretical. Regardless, Penn was known as an advocate for religious freedom, which was not a thing back in England in those days and seems increasingly threatened even in America these days, so I definitely admire that about him. We weren't supposed to take pictures of the Crown Jewels, but what can I say, I am a rebel. We bought tickets to tour the Tower grounds and spent a couple of hours there, choosing first to see the Crown Jewels. The curators have actually created a pretty cool tour leading up to the jewels that tells the story of their being passed down, destroyed, recreated, etc. What I found most interesting, though, was the video being played (on repeat) of the current Queen Elizabeth at her coronation when she was just 25 years old. What a strange life — she looked rather unhappy. Monarchy is so un-American that there’s something very foreign to me about the idea of being born to rule, whether you like it or not. Before we left, we also saw this super weird monument that had been created to commemorate all the people who’d been beheaded at the Tower of London, including names you’d recognize like Anne Boleyn. There’s something very strange about standing in such a location, where a human was executed. Names become people there, and history becomes sickening. So much of human history seems to be a mix of magnificence and wickedness — I felt that profoundly while in London and at the Tower. Whether it’s the history of the Anglican Church or the British government or William Penn or the United States, there are things to be proud of and things that should bring us to our knees. The day was winding down, but there were two more spots we really wanted to see before heading back to Paris: Buckingham Palace and Trafalgar Square (the latter we’d unknowingly been to earlier that day). We took the Tube to the palace first. For some reason I’ve always thought of Buckingham Palace as the queen’s house, but apparently she actually lives at Windsor Castle, which is about an hour away. At this point I started getting super sad that our day in London had gone so quickly. 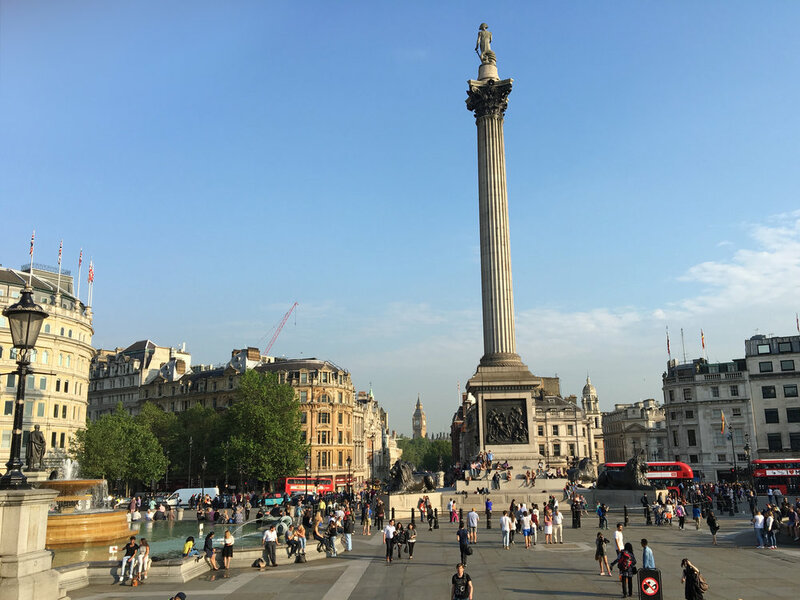 We trekked back to Trafalgar Square, only to realize we’d been there at breakfast. Now, though, the square was bustling with people, and the sun was lower. It felt surreal to be there and strange to be leaving. I tried to soak it in and willed myself to return. Next time I go to Europe, I want to spend several days exploring England. Something about it just feels like home to me. We had a Chunnel train to catch, so we grabbed dinner at a place called Garfunkel’s right off the square. (We surmised that it was like the Applebee’s of England, catering mainly to tourists looking for fish and chips.) As we made our way back to the train station, I felt a strong sense of sadness about leaving London, but when we finally made it back to Paris, back to the metro, back to our apartment, I was quite happy indeed to be crawling back into bed. All that to say, who wants to plan a trip to London? 2018?